Are Magnolia Tree Root Systems Invasive to Home Foundations? How Fast Do Magnolia Trees Grow? When Can I Prune My Japanese Magnolia? What Is the Name of a Magnolia Tree With Red Berries? Magnolia tree leaves make an ideal ingredient in compost. The green of the leaf has slight moisture and is nitrogen rich while the brown velvety underside is dry and carbon rich. With their thick, waxy and somewhat tough texture, magnolia leaves should be shredded, chipped or mowed over before being added to the compost pile. This will speed the breakdown of the leaves and therefore the creation of a rich friable compost. Run your magnolia leaves through a chipper or shredder machine to cut the leaves down into small pieces roughly an inch or less in size. Alternatively, pile the leaves on the lawn and run over them several times with a lawn mower to shred them as much as possible. Add shredded or chipped magnolia leaves to the compost pile in layers up to 2 inches thick. Alternate with layers of nitrogen-rich green material -- such as weeds, grass clippings, and vegetable and fruit cuttings if you have more than 2 inches of magnolia leaves. Add a pint or so of water over the freshly added compost pile ingredients to make them lightly moist and speed the microbial process. Magnolias are not considered poisonous to humans, cats, dogs or livestock. The magnolia (Magnolia grandiflora) is an ornamental, evergreen tree that produces a large, white flower in the early spring. 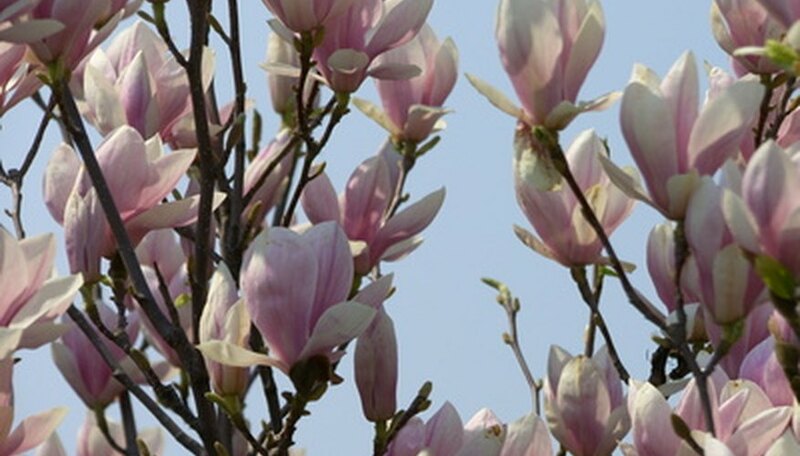 Plant Japanese magnolia in full sun and in well-draining soil. Magnolias prefer slightly acidic soil and do not tolerate overly wet ground in the root zone. Prune young trees to shape them, and remove any branches obstructing walkways or patio areas. Do not prune mature trees, as the pruning cuts do not heal well and leave it susceptible to disease. Apply a 2-inch layer of mulch around the tree, but leave a 3- or 4-inch space between the mulch and the trunk. Mulching preserves soil moisture and improves the appearance of the ground under the tree. 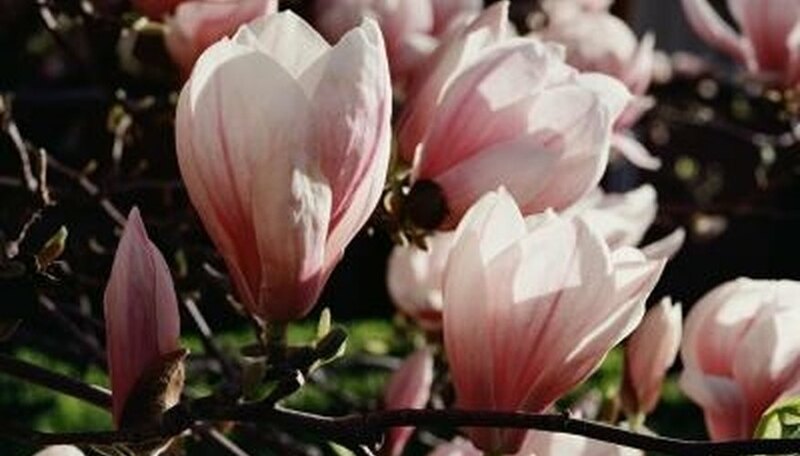 Fertilize the magnolia in spring after the blossoms drop and just as the leaves begin budding. Use a balanced fertilizer following label instructions for exact application amounts. Water a newly planted Japanese magnolia weekly in a single deep watering that thoroughly moistens the soil. Give water to established trees only during dry periods in the summer. Magnolia trees have a rooting system that is very unique. The roots are very long and do not branch out like other trees. These long, thick roots usually stay withing one foot of the earth's surface, making them a top rooting plant. These roots may damage housing foundations, driveways and sidewalks. The rate of magnolia tree growth depends on the specific species. Most magnolia trees grow at a slow-to-medium rate, averaging 1 to 2 feet a year. Cucumbertree, sweetbay, umbrella magnolia, Fraser magnolia and bigleaf magnolia are all deciduous types of magnolia trees. Other magnolias are evergreen, such as the Southern magnolia. Magnolias are native to the eastern half of the nation, with only the cucumbertree growing as far north as New York State. The Southern magnolia has the largest range, extending from North Carolina through the upper half of Florida and westward into Texas. The Southern magnolia has a reputation as one of the premier shade and landscaping trees in the Deep South. Its white flowers are the state flower of both Mississippi and Louisiana. Magnolia trees vary in their height, with the Southern magnolia growing to 90 feet, the cucumbertree to 80 feet and the pyramid magnolia up to 30 feet. The sweetbay magnolia may grow as tall as 80 feet in the South, but in the northern part of its range, it is a 10-foot-tall shrub. The Southern magnolia has evergreen leaves that accumulate under the tree when they finally fall off, making it impossible for anything else to grow beneath the tree. Homeowners need to take this into consideration before planting one on their property or when planting anything beneath it. Mulch around the base of the magnolia tree. This will help maintain water and soil temperatures. Consider allowing the lower limbs to grow and droop to the ground, especially with a Southern Magnolia. This will hide fallen leaves which can freely decompose for extra nutrients. On the other hand, you can prune off the lowest limbs, so you can mow beneath the tree, if desired. Prune after flowering, if necessary. If you plan to shape your tree a certain way, then do so when it is young (still after flowering) since older magnolias do not heal as well after pruning. Cut off any roots that begin to circle the trunk. Water only if you are experiencing a drought. Otherwise, you should not need to water your tree. Fertilizer is not needed. Magnolia flowers contain six to 12 petals. 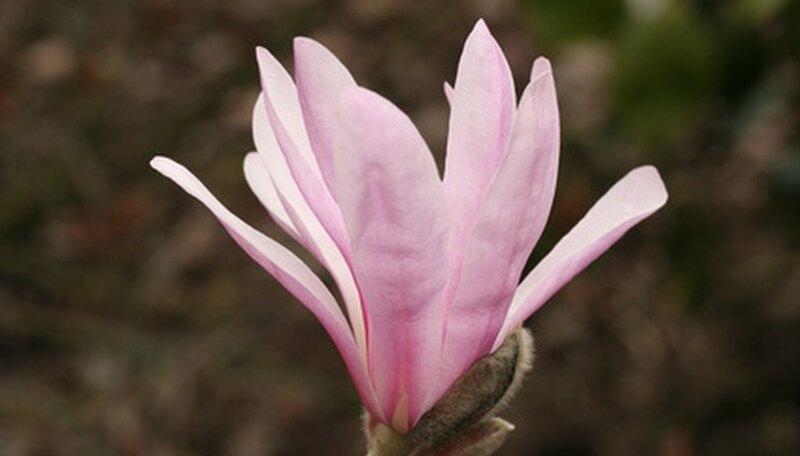 The petal color and overall flower size can vary between magnolia species, however. For example, the Southern magnolia (Magnolia grandiflora) and umbrella magnolia (M. tripetala) have 8-inch-diameter flowers with white petals, while the star magnolia (M. stellata) has flowers that measure only 3 to 4 inches across with pink-tinged petals. The sepals of the magnolia flower are located at the base of the flower head. Each magnolia flower has three sepals, which are petal-like and protect the flower before it blooms. The magnolia flower’s sepals are usually difficult to distinguish from the petals after the flower blooms. The magnolia flower has many stamens and pistils located in the center of the bloom. The stamens are long and thread-like, growing in a dense cluster atop the finger-like receptacle. The stigmas at the tops of the stamens curl. Each stigma is attached to a pistil, which will develop into a follicle or dry fruit-like structure. The pistils contain the ovules and follicles, which mature into the seeded fruits. The ovules, which turn into the seeds, are contained inside pale compartments called carpels. Each pistil has one carpal containing one or two seeds and one stigma. When the ovules mature, they become red seeds that burst forth from the splitting follicles. Magnolia trees are often used for decorative or ornamental purposes for landscaping, and grown for the beauty of their flowers. Some species, such as the star magnolia, can be grown in small spaces, such as in large pots or near patios. Magnolia trees produce hardy leaves that are generally a dark green on one side, and either maroon, gray with a silver tent, or light green on the bottom side. The leaves can be dried and used in floral arrangements and wreathes. The trunk of the magnolia tree can be used for timber. Magnolia tree wood is hard and somewhat heavy, which makes it a good choice in the manufacturing of doors, cabinets and furniture. Songbirds, migrating birds and other small animals consume the seeds of magnolia flowers, which provide protein in their diet. Beetles feed on the pollen from magnolia flowers and benefit from the protein intake as well. Like other trees, magnolia trees provide a source of shelter for different species of small animals and birds, particularly species of evergreen magnolias, which last through cold winter months. Large magnolia trees are well liked for their thick canopy, which provides shade in warm climates. The shade is important for cooling a living environment as well as providing shade for other plants and animals. Water under the entire canopy of the tree, not just around the trunk. Magnolia feeder roots usually extend out as wide as the tree. Water slowly so the water does not puddle on top of the surface. Water in the mornings if possible for better water retention. In addition, mulch around the tree with about 2 to 4 inches of mulch, such as pine needles or bark, to also help with water retention. Water more frequently in the first two years after planting. In general, water your tree with about 15 to 20 gallons once a week for the first two years. Then for the third year, water your tree with 15 to 20 gallons twice a month. After the third year, water only when you are experiencing long dry spells, such as a month or more of little rain or when you notice the leaves wilting. Insert a wooden stake into the ground beside your young magnolia plant and tie the trunk to the stake with twine. Staking the magnolia plant will help it to become established and protect it from breaking in high winds. Spread a layer of organic mulch, 2 inches thick, on the ground over the root area of your magnolia plant to retain soil moisture. Keep the mulch about 2 inches away from the trunk to prevent collar rot. Add more organic mulch every spring to keep the layer at about 2 inches thick. Water your magnolia plant regularly during the first growing season, about two or three times per week, soaking the soil down to and around the root area. After the first growing season, water your magnolia once or twice each week in the absence of rainfall. 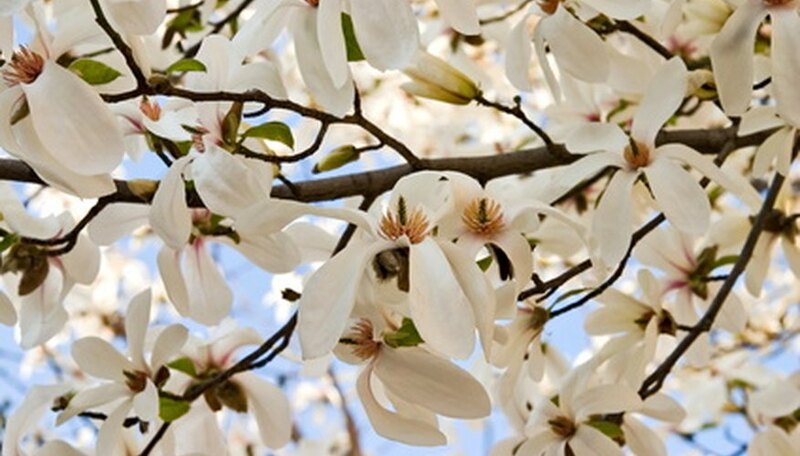 Feed your magnolia plant a slow-release, all-purpose tree fertilizer once each year in the spring. Follow the dosage instructions on the fertilizer package. 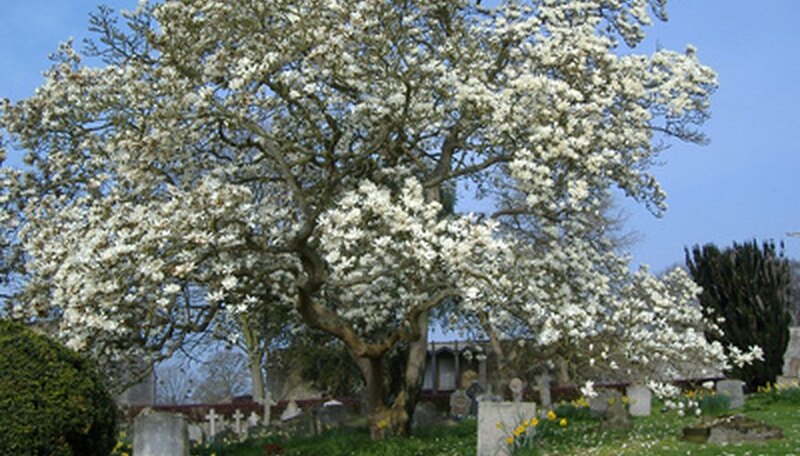 Prune your magnolia tree after the tree is finished flowering to remove any dead, diseased or damaged growth. You don’t need to prune your magnolia regularly unless you want to reduce its size. Keep in mind, however, that pruning to shape or size your magnolia will likely remove wood with buds, reducing the blooms for the next season. The Jane magnolia tree is a hybrid variety that does well in a wider range of growing zones than many other magnolia varieties. Viable in zones 3 through 8, the Jane magnolia will thrive in areas that have low temperatures as cold as minus 40 degrees Fahrenheit. The Jane magnolia is fairly compact as far as magnolias go. It typically grows to about 10 or 15 feet tall and has a spread of roughly 10 feet. This more modest size makes it a good choice for even smaller yards as it will not overpower the whole yard. The Jane magnolia blooms in late spring, after threat of frost has passed. The blooms are a beautiful pink, ranging anywhere from a fairly pale, purply pink to a vibrant fuchsia color on the outside and white on the inside. The shape of the flowers is reminiscent of a tulip, but the scent is definitely, distinctly magnolia. Wait until after the blooming period to prune the Japanese magnolia. While most flowering trees are pruned in early spring, the Japanese magnolia has set its buds by that time and pruning will reduce flowering. Determine why you are pruning before you begin. If it is to control growth, or just to clean up dead wood, knowing why you are pruning helps you devise a strategy. Cut out dead wood, weak wood and any branches crossing over others or growing in an undesirable fashion all the way back to their points of origin. Use sharp pruning equipment to avoid crushing the wood. The tallest of the magnolia trees are the Southern magnolias, which are the state trees of both Mississippi and Louisiana. The Southern magnolia can grow as far west as Texas and reaches heights of as much as 90 feet. When planted in the southernmost regions of its growing area, the sweetbay magnolia can reach 80 feet, but it is only a 10-foot shrub in the most northern reaches of its territory. The pyramid magnolia is a shorter variety of magnolia tree that reaches only 30 feet tall by comparison. Another shorter magnolia tree species is the umbrella magnolia. Growing to just 40 feet tall, the umbrella magnolia has big, showy flowers, but it lacks the sweet fragrance of the Southern variety. Magnolias can be grown as far north as New York; however, the further north they are planted, the shorter they tend to grow. 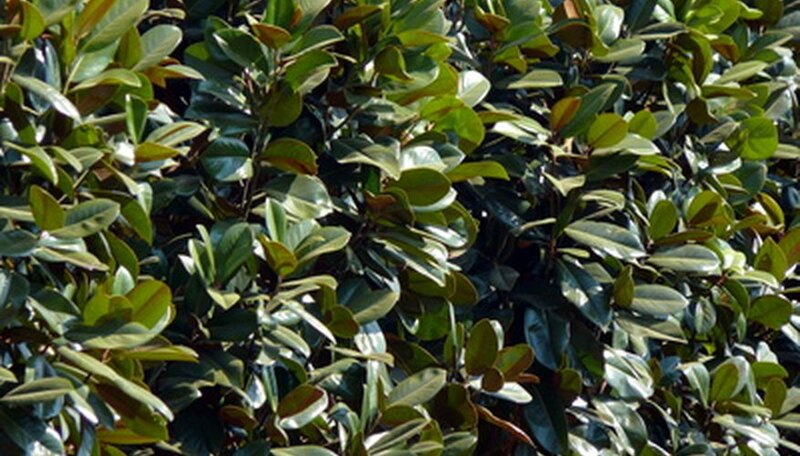 The sweetbay magnolia grows as a 10-foot shrub, while the Ashe magnolia grows to a respectable 20-foot shrub. Southern magnolia can be grown in areas with mild winters -- U.S. Department of Agriculture Plant Hardiness Zone 7 and south. Plant in full sun in deeply dug soil, rich in organic matter. Magnolia likes moist soil, though the trees will languish if waterlogged. Southern magnolia blooms open in summer, spreading 6 inches or more. After the petals drop, a large, furry cone develops. The cone opens up in fall, exposing the red berries. Enjoy the berries on the tree, or take them inside for interior or holiday decoration. Pick the cones as soon as they open up, before the seeds turn black and fall out. Don't plant the seeds for propagation. It can take 5 to 20 years for a magnolia to bloom, and there is no guarantee that you will get a magnolia that will bloom. Instead, plant a named cultivar. 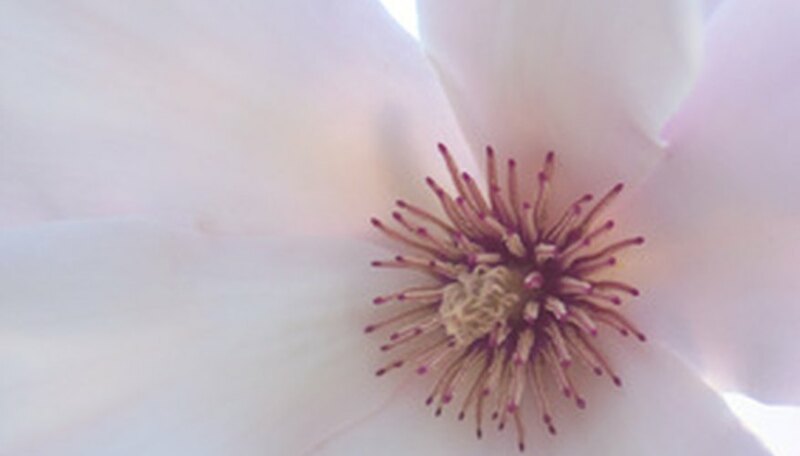 Magnolia canopy and root growth require at least 18 nutrients, according to Hubert Conlon, Extension specialist at the University of Tennessee. Nitrogen, phosphorus and potassium (N, P, K) are the most commonly applied nutrients. 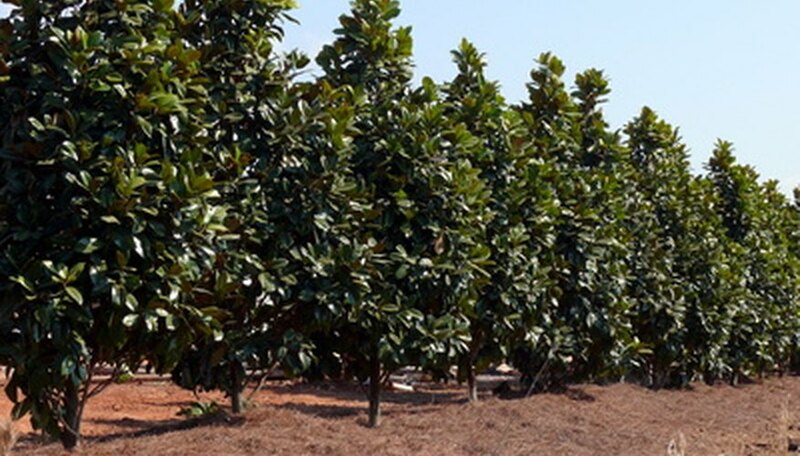 Magnolias responded to high-nitrogen slow-release fertilizer (20N-2P-8K) with more root growth and less canopy growth, in Tennessee growth trials. A more balanced formula of nitrogen to potassium (8N-3P-7K) applied monthly produced healthier magnolias. 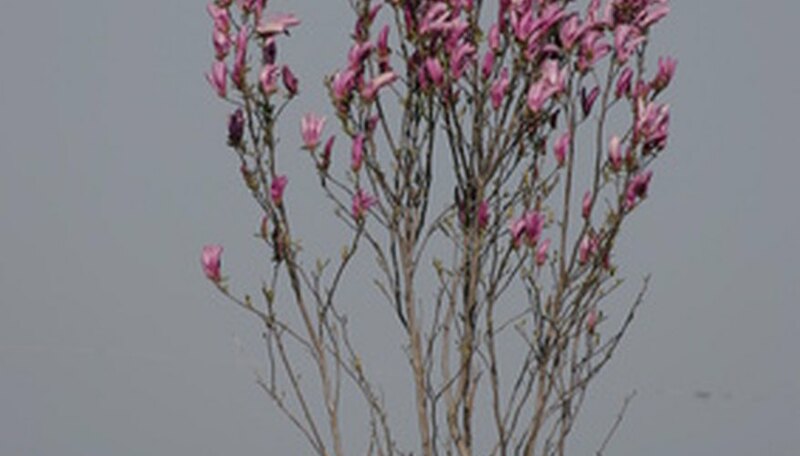 Magnolias receiving 2 to 3 percent phosphorus or potassium in the Tennessee growth trials were unaffected. Nutrient levels are lower and release-rates slower using organic material such as magnolia food. Manures have high N-P-K ratios are not recommended for magnolias. Cotton-seed meal is close to the University of Tennessee experts’ recommended ratio. Composted sludge applied with commercial fertilizer produced even magnolia growth in the Tennessee Extension trials. A study by the International Society of Arboriculture found that mulched magnolias surpassed unmulched trees in branch and canopy growth. Finished compost with known components used as mulch benefits by providing micro-nutrients as it is watered into the soil. Use a saw to trim thicker branches and pruning clippers for smaller branches. A straight cut is best. Seal larger branches with a tree sealer, available at most nurseries, to prevent sap from seeping out. Trim a magnolia tree after it has finished flowering, usually in the fall. You can also prune it during the winter months as well. You can prune damaged branches at anytime, if needed. Trim a magnolia while it is still a young tree, if possible. While you may need to cut off damaged branches from time to time, the best time to shape a tree is during the first few years after planting. Older trees may not heal as well as younger trees when trimmed. Trim branches as close to the trunk as possible. For smaller branches that are offshoots of other branches, cut it off near the adjoining branch. This is true for trimming off damaged branches or trimming for shaping purposes. Plan out shaping. Do not cut branches that are too close together. If you do, the next flowering season, you may have large gaps with no flowers. Feed your magnolia tree beginning in the early spring, just as the tree foliage is starting to unfurl. Scatter a 10-10-10 or 8-8-8 granular slow-release formula from 12 inches out from the trunk to 12 inches past the drip line. The goal is to feed the largest roots and the widest soil footprint. Repeat the application of slow-release fertilizer in the early summer. Make a third late summer application in warmer climates where frost and freezing temperatures are not an issue. Water the fertilizer in deeply after every application to begin the percolation of nutrients into the soil. Mulch over the fertilizer application in spring with several inches of shredded bark, leaf mold or cocoa bean hulls to hold moisture in the soil and insulate the roots. 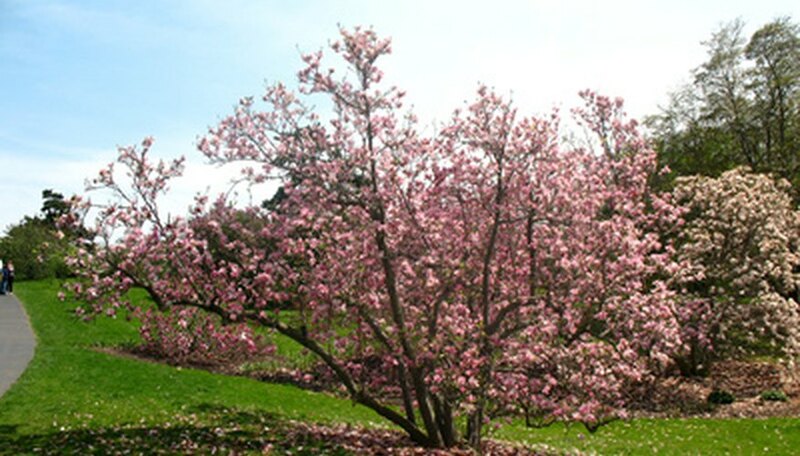 Refrain from fertilizing fall-planted magnolias until the following spring to prevent new growth that will be unable to harden off before or survive the winter cold. 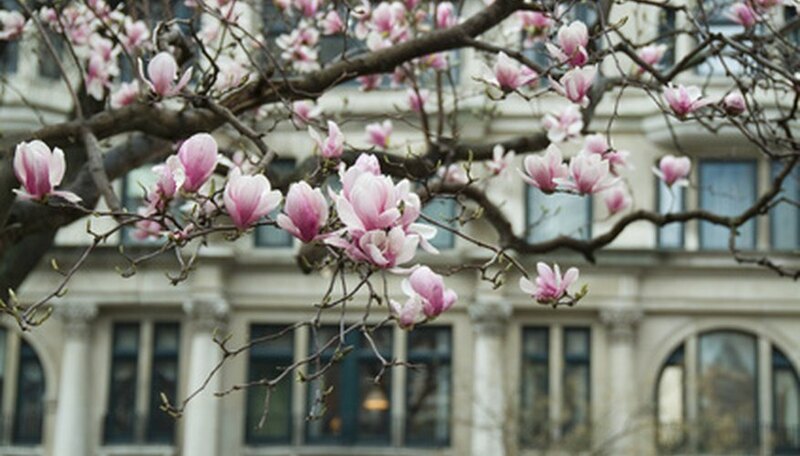 Magnolia trees grow from 15 to 90 feet tall and are from 15 to 55 feet wide. Magnolias like moist, rich soil with good drainage. Magnolias tolerate areas with partial shade. Transplant burlap-wrapped or container-grown trees in the spring, just before new growth begins. Magnolias are susceptible to scales that will cause the leaves to turn yellow. These areas need to be pruned out and destroyed. Magnolia root borers will attack magnolia trees as well. 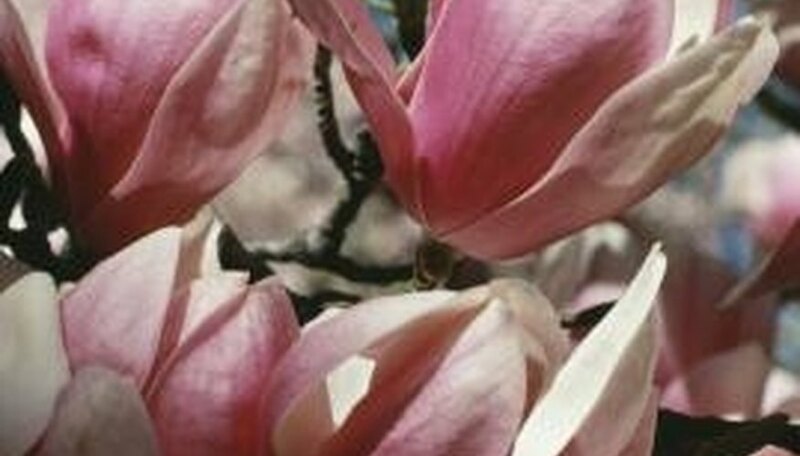 Most diseases that affect magnolias are not too serious. These include stem cankers and powdery mildew. A late spring frost can ruin early-blossoming magnolia flowers. Gather fresh magnolia seedpods. Seeds that are too old won't germinate. Remove the red seeds from the pods either just before or just after the pods burst open. Remove the red coating by soaking the seeds in a container of water for a few days. If the seeds float, they are too old. Only use the seeds that sink to the bottom. Squeeze the hard seeds out of the red coating, then wash the seeds with water and dish soap. The oily coating will prevent water from reaching the seeds. Mix a germinating medium of 2 parts peat moss, 1 part loam and 1 part sand. Place the mixture in a sprouting tray. Plant the seeds twice as deep as they are wide, then water them. Check the soil frequently to make sure the soil hasn't dried out. The soil should be moist, but not wet. Cover the planting with about 1/2 inch of compost. Cover the tray with plastic wrap to maintain humidity levels, then place the tray in a warm, dark place. The seeds should germinate in about four weeks. Allow the seedlings to grow for four or five weeks before re-potting them in individual pots. As they grow, slowly expose them to progressively more sun. Start with an hour a day after they have sprouted for a couple of days, then increase the time by 30 to 60 minutes per day. Inspect the branches of the yellow butterfly magnolia for signs of dead, diseased or damaged branches any time from summer to late autumn. Mix a solution of 1 part bleach and 10 parts water in a bucket. Place all pruning tools in the bucket. Cut off unhealthy limbs at their base. Prune back to a Y-intersection if the wood below that point is healthy. Remove wood with a 3/4-inch diameter or less with anvil pruners. Cut larger branches with lopping shears. Dip the tools into the bleach solution to disinfect them between each cutting. Discard the bleach solution when the pruning is finished. Control the size of the yellow butterfly magnolia by removing select limbs. Cut these limbs off at their base or down to a crotch intersection. Remove limbs that press against other limbs or cross other branches. Prune away the lower growth from the bottom three or four feet of the bush. This will open up the base of the plant and make it look more like a tree. Make your cuts at a 45-degree angle to keep water from pooling at the cut. A cut should be made about an inch from the main branch or trunk so that the cut does not injure the bark of the bush. Cut out branches that cross over each other or look diseased. The star magnolia does not like to have its growing tips cut off, so be careful to cut off a whole branch and not just the end of it. Typically, the branch will slowly die once a growing end is trimmed, and if the branch is large the flowering will be interrupted for a couple of years. Leave the tree alone if you want a full rounded bush covered in blossoms. The flowers form at the tips of the branches so any pruning will reduce the flowers for a while. You should have blossoms from the ground to the top of the bush, producing a spectacular bush in the spring. Plant magnolia trees in a location where they receive full sunlight throughout spring and summer but are protected from high winds. Avoid overly wet or dry soils. 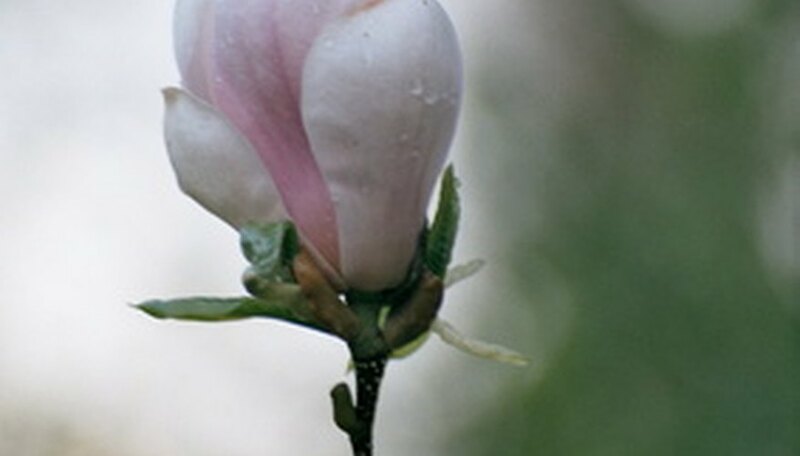 Magnolias grow best in moist soil that's rich in organic matter. Spread a 3-inch layer of mulch over the soil beneath the magnolia, covering a 3- to 5-foot diameter circle around the trunk of the tree. Leave a 3-inch space between the mulch and the trunk. Water newly planted magnolias once weekly during the first spring and summer. Thoroughly soak the soil at the base of the tree to a 10-inch depth. Reduce watering to once every 10 to 12 days in the second and third year. Once established, water during extended dry periods when the soil begins to dry out. Fertilize magnolias each spring when the leaves begin growing in. Apply a balanced slow-release fertilizer at the rate recommended on the package for your tree size. Prune out dead and damaged branches in spring once the tree begins to leaf out. Cut these branches off where they join healthy wood. Cut out water sprouts, which are quick growing branches that grow vertically up from the horizontal branches, in late spring or early summer after flowering completes. A magnolia tree with a 4-inch or smaller trunk diameter has the best chance of survival when dug up and moved. Dig up a magnolia tree during the winter dormant season and remove as much of the root system as possible. Henry Hicks magnolia trees have dark green leaves with frosty, whitish-green undersides that shimmer in the wind. The thin bark tends to break easily. The flowers of the Henry Hicks magnolia tree are creamy-white in color and smell like lemons. These flowers bloom from June until September. Henry Hicks magnolia trees grow up to 40 feet high in the north and up to 60 feet tall in the southern states. The spread typically ranges from 15 feet to 25 feet. Henry Hicks magnolia trees are often used to add vertical definition in shrub borders. Commercial landscapers frequently plant these trees around parking lots and on highway medians. Henry Hicks magnolia trees do well in USDA hardiness zones 5 through 9. This tree needs moist, acidic soils and thrives along river banks and swamp areas. The Henry Hicks magnolia tree is susceptible to verticillium root rot, which is a soil-borne fungal disease that attacks the tree’s root system. Stressed magnolia trees also attract sassafras weevils and scales. Collect fresh magnolia seeds. 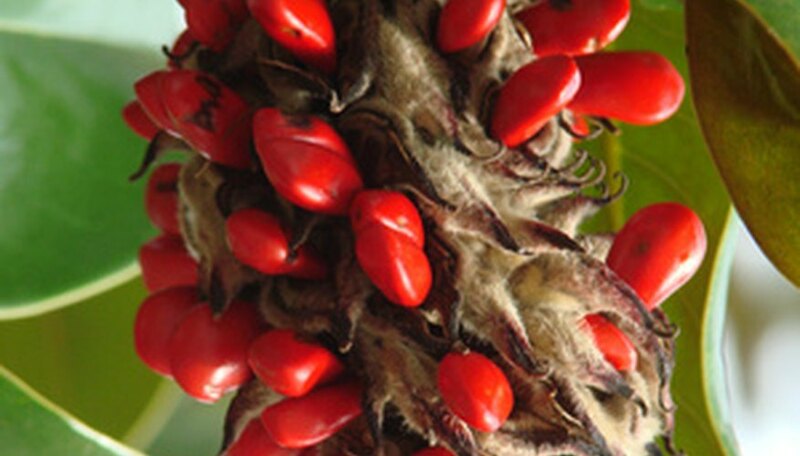 These are the red seeds taken directly from the magnolia seed pod–the seeds should not be dry. Soak the seeds in plain water for 48 hours. Any that float are no good and should be discarded. Remove the bright red hull from the seeds with your fingers. After soaking in water for two days the red hulls should peel away easily. Place a few drops of liquid dish soap in a small plastic container and add water. Wash the seeds between your thumb and fingers in the slightly soapy water until the seeds no longer feel oily. Rinse the seeds thoroughly, making sure all of the soap is washed off. Mix two parts peat moss, one part sand and one part loam in a planting tray and plant your seeds 1/2 inch deep. Water lightly and cover the planting tray with plastic cling wrap to hold the moisture in. Keep the tray in a warm place out of direct sunlight. Your seeds should sprout within approximately four weeks. Four weeks after the seeds sprout pot or plant outdoors after all danger of frost has passed. The colors of magnolia flowers vary, from the white of the southern magnolia to the yellow of the Fraser magnolia. The flowers of the southern magnolia are between 6 and 9 inches in diameter, while those of such species as Bigleaf magnolia are as wide as a foot, with the umbrella magnolia's blooms between 7 to 10 inches across. 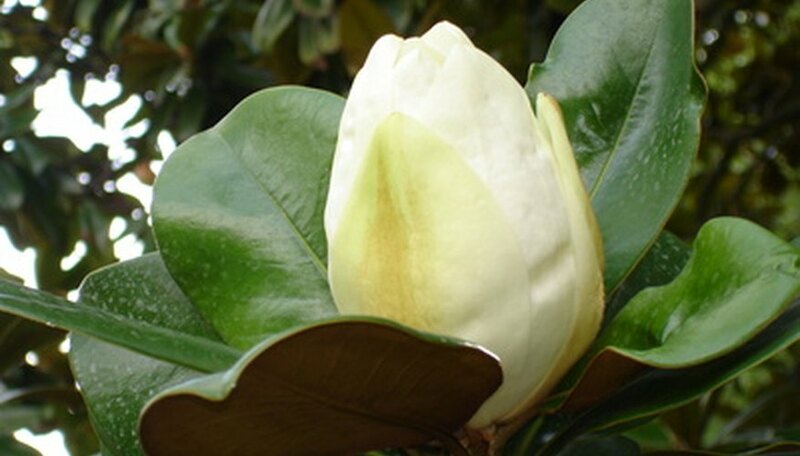 The pyramid magnolia has 4-inch flowers, and those of the cucumbertree are only 2 inches wide. Magnolia flowers typically produce large amounts of pollen but no nectar. Beetles seeking to use the protein in the pollen for food wind up pollinating the magnolia trees. The magnolia flowers in the American species possess three sepals and a varied number of petals. For instance, the sweetbay magnolia has nine to 12 petals while the umbrella magnolia flower has from six to nine. Magnolias normally bloom in late spring and into summer. By midsummer, the flowers develop into the fruit of the magnolia containing the tree’s seeds. Rake the soil around the magnolia tree and bag up the debris. Pour the fertilizer into a broadcast spreader, at the rate suggested on the package for the size of your tree. Apply the fertilizer beginning at the outer two-thirds of the distance from the trunk to the dripline. Determine the radius of the widest part of the tree. Spread the fertilizer 50 percent of that measurement beyond the dripline. Water the application area if no rain is expected.